When I first started this blog, I said I would put up the successes and failures of the recipes I cooked. Well here’s the first kind-of-fail. It’s not so much a fail as the cupcakes were still quite nice, but there are a couple of things that the recipe called for that needed to be adjusted. I got the vanilla cupcake recipe from Martha Stewart's website, and the whipped chocolate buttercream recipe from Donna Hay's book Off the Shelf. The errors were very obvious – there was too much flour in the cake which made it dense and dry, and there was too much dark chocolate in the icing which made it bitter. The style of icing was a new one for me. At one stage I was about to give up and throw it away as it was lumpy and curdled and just awful, but I kept going, and after a couple of minutes beating on high, the mixture came together beautifully. 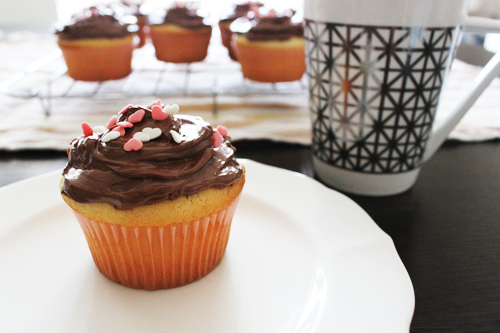 I will make this recipe again at some point as I love vanilla cupcakes with chocolate icing. The recipe below is adjusted to how I think it should be (less flour and chocolate). If anyone has a great cupcake recipe please send it through! Preheat oven to 180° C. Line cupcake pan with paper liners. In a bowl, sift the flour, baking powder, and salt. In another bowl, beat the butter and sugar until light and creamy. Add the vanilla, and continue beating, adding the eggs one at a time, mixing until combined. In the bowl with the eggs, add the flour mixture and milk a bit at a time. Divide batter evenly among liners, filling about 2/3 full. Bake in the oven for about 20 minutes, or until the a skewer comes out clean when tested. Transfer to a wire rack to cool. In a clean bowl, beat the egg white and icing sugar until stiff peaks form. Continue beating and add the cubes of butter slowly. The icing will curdle at first, but keep beating for 10 minutes until it becomes thick and silky. Fold through the vanilla and melted chocolate until well combined.